PEACE when there is... NO Peace! It is very important to understand the Biblical and Historical facts about Israel… Israel became a nation about 1300 BC… two thousand years before the rise of Islam! The people of modern day Israel share the same language and culture shaped by the Jewish heritage and religion passed through generations starting with the founding father Abraham. Since the Jewish conquest in 1272 BC, the Jews have had dominion over the land for one-thousand years with a continuous presence in the land for the past 3,300 years. Throughout centuries Jews prayed to return from the Diaspora to Israel… During the first half of the 20th century there were major waves of immigration of Jews back to Israel from the Arab countries and from Europe. In 1948 Jews re-established their sovereignty over their ancient homeland with the establishment of the modern State of Israel. It was only after the Jews re-inhabited their historic homeland of Judea and Samaria (so-called West Bank), that the myth of a Palestinian nation was created and marketed worldwide. Jews come from Judea, not Palestinians. There is no language known as Palestinian… or any Palestinian culture distinct from that of all the Arabs in the area. There has never been a land known as Palestine governed by Palestinians. Palestinians are Arabs indistinguishable from Arabs throughout the Middle East. For over 3,300 years, Jerusalem has been the Jewish capital. Jerusalem has never been the capital of any Arab or Muslim entity. Even when the Jordanians occupied Jerusalem (1948 - 1967), they never sought to make it their capital, and Arab leaders did not come to visit. In the Bible, Jerusalem is mentioned over 669 times and Zion (which usually means Jerusalem, sometimes the Land of Israel) 154 times, or 823 times. The New Testament mentions Jerusalem 154 times and Zion 7 times. Jerusalem is not mentioned once in the Koran. Jerusalem is also not mentioned in the Palestinian Covenant. King David established the city of Jerusalem as the capital of the whole Land of Israel. Mohammed never came to Jerusalem. Jerusalem remained under Turkish Ottoman Empire rule from 1517 to 1917, and under British rule from 1917 to 1948. The responsibility for keeping the Arab population, who are descendants of the Arab refugees, rests only on the shoulders of the Arab countries that created the problem by attacking Israel in 1948. Peace when there is no peace…! “They dress the wound of my people as though it were not serious. ‘Peace, peace,’ they say, when there is no peace.” Jeremiah 6:14 There is NO peace partner for Israel that truly wants peace… found in the Palestinian regime run by either Hamas or the Palestinian Authority (P.A.). Fatah and Hamas have never given up their agenda of driving out Israel and running them into the sea. They want the complete extermination of all Jewish people and their hatred cannot be cooled with any peace treaty. In the meantime, Israel has been weakened by all the “land for peace” plans by the U.S.A, as Israeli’s dream of a compromise or a negotiated “peace” between them and their neighbours... It is still clear in Jewish memories that in 2005, then Prime Minister Sharon, in whom they trusted and believed to be the champion of the Jewish Settlements… pressured by the US… suddenly turned into something, or someone, that they couldn’t understand, by demanding that Gaza be given to the “Palestinians”. Over 9000 Jews were forcibly uprooted from their homes, and many of them are still homeless to this very day. It stands as one of the saddest days in Israel’s recent history. Since Israel left the Gaza Strip in 2005, Palestinian terrorists have launched about 10,000 rockets from there at Israeli civilians (including during Obama’s only visit to Israel in March 2013, as president, violating yet another cease-fire agreement). The question must be asked once again today… why is it that the US is so intent on dividing the small Jewish State of Israel? Why is Kerry now giving his full attention to the destruction of Israel with all the horrible things now happening in the Arab World? Why is Obama giving his support to the so-called ‘Rebels’ in Syria, when the world knows they are mostly made up of Hezbollah and al-Qaeda? Why has Obama supported Morsi in Egypt and the Muslim Brotherhood? Maybe more important questions should be asked? How Obama could make Prime Minister Netanyahu agree to turn 104 Arab “Palestinian” terrorists with Israeli blood on their hands loose in advance of a promise of a meeting with Abbas that everyone knows will not produce peace or anything that resembles peace? And why can Obama get Netanyahu to turn 104 Arab murderers out of prison against the will of most of the Israeli’s? Since the 1993 Oslo Peace Accord requiring Israel to hand over parts of Judea and Samaria the so-called West Bank to the Palestinian Authority (P.A. )… Palestinian terrorist attacks have killed over 1,000 Israelis. Each and every time that Israel pressured by the U.S. thinks of giving into Arab demands, more problems arise for Israel...! Once again, Israel has been pressured to the extreme by USA’s President Obama who has NEVER been a friend of Israel and has done nothing but give hope and resolve to Israel’s enemies. During August he purposely allowed the leaking of sensitive Israeli military information to newspapers to undermine Israeli sovereignty. God is not happy and His judgment does not always come in grand moments. There is coming a time when this leader will bitterly regret the day that he stood against Israel! How God will deal with this present situation and throwing Israel “under the bus,” remains to be seen… but, know this as it is no truer now then when it was written thousands of years ago; “And I will bless those that bless you and curse the one who curses you. And in you shall all families of the earth be blessed,” Genesis 12:3. In the end, US pressure to force Israel into this “peace” deception will harm the US a lot more than Israel… God will not be silent over this issue! When God restores the fortunes of Judah (part of so-called West bank) and Jerusalem, as He has done over the past century, He will enter into judgment with all nations over the division of His Land! It is also written, “On that day I will make Jerusalem a heavy stone for all the peoples. All who lift it will surely hurt themselves.” (Zechariah 12:3) The US is no exception! Just as the sun sets in the west at the end of the day, so at the end of this age… the sun is now beginning to set over the West while God’s glory is rising over Zion! After Great Britain had issued the Balfour Declaration to establish a homeland for the Jewish people in Palestine… but then in the end refused to support its implementation, it ceased to be a world power in less than a decade! The same will happen to the US as they now pursue a similar path; it is already happening rapidly under President Obama. However, Israel will also be hurt if they continue to pursue these futile peace negotiations. It will be Oslo revisited again with more death and pain. The Oslo Peace Accords led to more than 1,200 Israeli deaths and 14,000 wounded in terror attacks! This is equivalent to 50,000 dead and almost 600,000 wounded in the US. 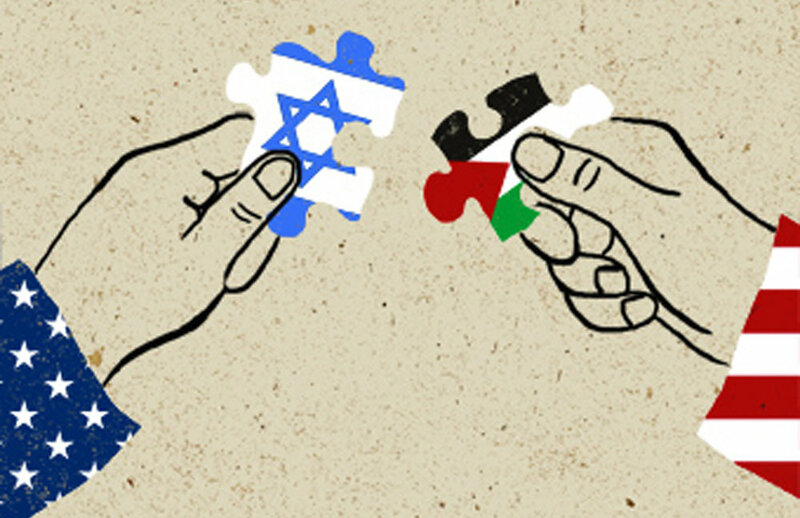 Only God knows what another disastrous “peace” agreement with the Palestinians will lead to... But one thing is clear: it will definitely not lead to peace! We must NEVER force Israel to give up the land God has given them. It is theirs…! Genesis 17:7-8; God says He will establish an “everlasting covenant” with Abraham… Psalm 89:28 - 36, and Genesis 15:18 – 21; describes the location of the land God gave to the Israelites. Jerusalem should never be divided for any reason… It is the property of the people of Israel. The president of the United States or any other leader has no authority to tell the people of Israel what they can and cannot do with the city of Jerusalem. God did not make a covenant with Washington, D.C. He made a covenant with Abraham, Isaac, and Jacob and that covenant stands… It is still the covenant! The Israeli and Palestinian negotiations will take about nine months and will be finished around March 2014… strangely coincides just before the first “Coming Blood Moons in April 2014” (see our Newsletter March 2013). Could these things come together at the same time as the blood moons starting in 2015? Time will tell. Every time the world tries to divide the Land of Israel, God’s judgment is brought to this world. This time will be no different! Almost all the governments of the West are against Israel…. Zechariah said Jerusalem will be a stumbling block, and all nations will be against Israel in the end, and we are there. The actions of the Obama Administration show us the world is closing in on the abomination of desolation. Europe is backing the American push for false peace… and we know in the Bible the promise of false peace will be signed, sealed, sometime in the future and delivered by the EU, not the US even though they are involved in implementing this false peace today. Consider Syria… From 1948 to 1967, the Syrians regularly fired artillery shells from their dominant positions on the Golan Heights down at Israeli border communities and Fatah (founded by Yasser Arafat) used the territory to launch terrorist raids into Israel… until Israel captured it in 1967. 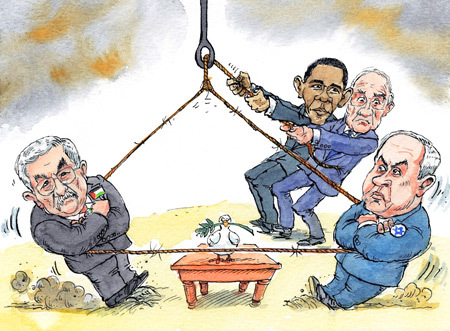 But since the US-brokered talks between Israel and Syria began in 1999, “so-called peacemakers” have pushed to advance their agenda’s that a full withdrawal by Israel from the strategic Golan Heights in exchange for peace with Syria involved a risk worth taking. Their logic was that in an era dominated more by aerial threats (jets and missiles) than terrestrial ones (soldiers and tanks) – the territory was no longer vital to Israeli security and could be traded for a so-called double boon: peace with Syria and elimination of Iran’s greatest strategic ally. Current events reveal the deeply flawed groundwork ‘assumption of land for peace’ with unstable Syria. No Israeli territorial concession is needed for Iran to loose its only Arab ally… the Syrian civil war will ultimately accomplish that. Basher Assad’s regime will eventually fall because the daily slaughter of one’s own people (with over 100,000 dead) is unsustainable when each atrocity can be instantly uploaded to the Internet. Moreover the Bible also tells us that Damascus is going to be a heap of ruins someday (Isaiah 17). Whoever replaces Assad will be NO friend of Israel and to those who armed, funded, and prolonged his massacres: Iran and Russia. Iran and its proxy Hezbollah have also been substantially involved in fighting the rebels on the ground, and therefore will be distanced from post war Syria far more than any Israeli-Syrian peace could have separated Iran and Syria! More importantly… the “land for peace” plan with Syria would have transferred the strategic territory from Israel to an Alawite-led regime reviled by the mostly Sunni rebels who will eventually overthrow it and likely disavow its commitments – including any peace deal with Israel. The Syrian rebels already control much of the Syrian side of the Golan Heights (where they recently kidnapped 21 UN peacekeepers stationed there) and have openly threatened to attack Israel next. And so, Israel’s tangible security asset of Golan Heights (earned with the blood of over 2,100 IDF soldiers who died in Israel’s 1967 and 1973 wars with Syria) would have been traded for “peace” with Assad… but rather “land for war” with Syrian Islamists is what Israel may receive just a few years later! Most certainly, “land for war” has a compelling record... In 2000, Israel withdrew from southern Lebanon and in 2006 was attacked from there by Hezbollah. It was only by God… and the force of Israel’s military response in the war that followed – rather than any territorial concession that prevented any subsequent cross-border attacks by Hezbollah… although the terrorist group still pursues murderous plots abroad, including in Europe. 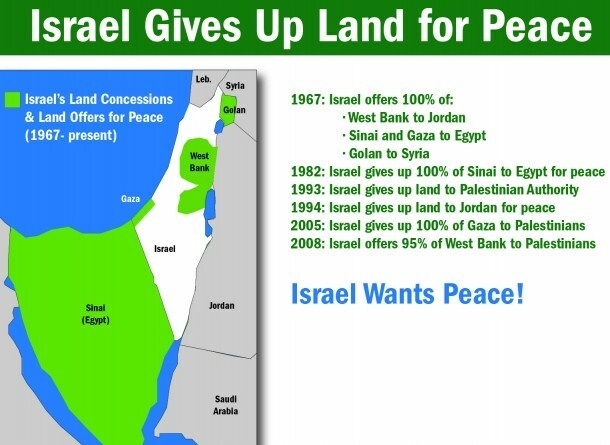 The 1994 ‘Jordan-Israel’ peace involved very little land (and heavily depends on survival of the Hashemite Kingdom)… so the best example supporting the “land-for-peace” model is Egypt, which agreed to peace with Israel for the return of the Sinai Peninsula. That ‘cold peace’ has held since 1979 mostly thanks to over $60 billion of US aid to Egypt and an unpopular, secular autocrat (Hosni Mubarak). With all of the chaos plaguing Egypt now, particularly in the Sinai (from which a single, high-casualty attack on Israel could provoke an Israeli response), the future of the Egypt-Israel peace is hardly certain and could change at any given moment! The spoils of war normally go to the victor! History has taught that “land for peace” turns out to be an illusory promise that only encourages military aggression...! Man, has tried for many years to find a peaceful solution to this “perceived problem” of instability in Israel. For thousands of years, this tiny strip of land has been the centre of many battles for control as a strategic land corridor for…trade, commerce, and military supremacy. No other land mass has been at the centre of world history as this little country has been. The nation of Israel is tiny and only about the size of the Kruger National Park in South Africa, but it has caused all eyes to be focused on this area for 4000 years, and the newest round of peace talks are nothing but a continuation of what God will ultimately do. The road to actual peace between Israel and the Arabs is full of land mines...! Whether or not any kind of peace is actually attained, the Scriptures indicate that this current “peace process,” will precipitate another Arab-Israeli war! The Israeli-Arab conflict is graphically portrayed in Psalm 83… A look at a map of the Middle East in Biblical times will identify the countries involved today… These are the nations that are saying, “Come, and let us cut them off from being a nation; that the name of Israel may be no more in remembrance.” This confederacy, of course, is a reference to the Arab nations. Although this Psalm is a prayer to God for the defeat of these nations… the actual conclusion of this conflict is not described. But, the Scriptures reveal how this Arab defeat is accomplished. Half the tribe of Manasseh received ALL of “Bashan” (Deuteronomy 3:3, 4, 13) and Golan was part of Bashan (Joshua 21:27) and still is. And, Gilead is a part of the East Bank of the Jordan River. The current “peace process” in the Middle East is negotiating the status of the Golan Heights and the “West Bank” (Judea and Samaria) as well as East Jerusalem! 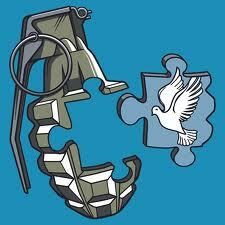 “Peace Process” always moves towards war…! Can man negotiate with God on the status of His promises to Israel? If Israel is forced to temporarily compromise “Land for peace,” the Scriptures indicate that before the “time of trouble” is over, Israel will again acquire the Golan Heights and not only the West Bank - but the East Bank as well… Man cannot dictate to God! The battle is for the ‘soul’ of Israel… Jerusalem…! Very soon, we may see Jerusalem surrounded by invading armies who dare come against God’s chosen people. Nations such as Iran have made clear that their intentions are less than peaceful. They started out with the lie, as all Muslim countries do to deceive… that their endeavours at nuclear energy was nothing but ‘peaceful.’ But due to the weak response from the rest of the world, they have made it clear that their purpose is only to make a bomb… and with that bomb, rule the Middle East and destroy Israel. 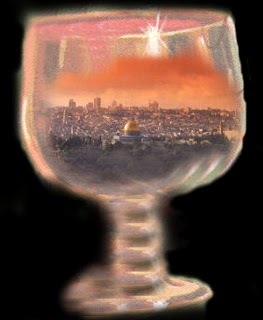 The world is drunk with East Jerusalem… It is said in Jewish sages that God started creation on the exact place in East Jerusalem where the Mercy Seat of the Ark of the Covenant stood. God wrote His name on the Holy City. It is where the holy priest Melchizedek once approached Abraham… and Abraham recognized the holy priesthood he saw. The writer to the book of Hebrews reiterated the promise priesthood of Melchizedek, which was fully realized in Yeshua (Jesus Christ). Satan knows East Jerusalem is important, and is pushing his evil plan through powerful people and nations to try to take it from God. West (W.) Jerusalem is the new part of the city. The Holy City - often called the City of David, is East Jerusalem. We know from Scripture that no one, including Satan, can take the Holy City from God. When Daniel announces this end-time “peace” treaty, it also reveals that the breaking of the treaty… in the exact mid-point of this seven-year period… will bring “an end to offering and sacrifice.” Because the breaking of the treaty brings an end to “offering and sacrifice,” that can only mean that they are intricately tied to the treaty. Moreover… the Jewish people cannot make offerings and sacrifices without a temple (which is why Jews have not been able to have sacrifices since A.D. 70 - the year the last temple was destroyed), which tells us that the rebuilding of the temple is a necessary part of the confirmation of the treaty! 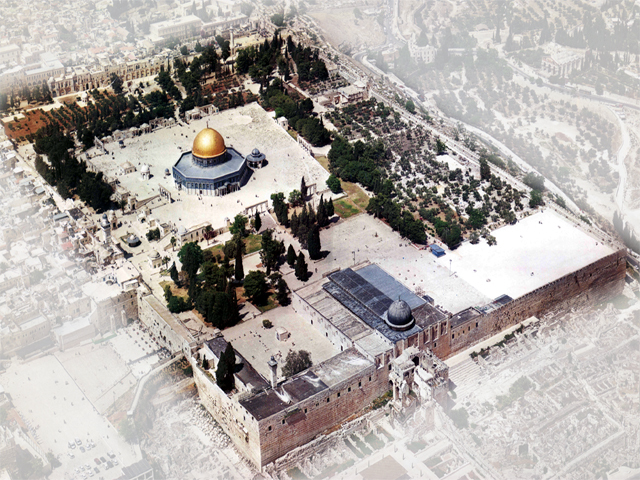 Most likely, this temple will be built on the same spot where the first two temples were constructed… the Temple Mount. Certainly, any orthodox, or ultra-orthodox, Jew who backs the building of the temple would not give a thought of constructing it anywhere else. Furthermore, since the rebuilt temple is called “the temple of God” (2 Thessalonians 2:4), it, obviously means it will be built where the first (and the second) resided… with the ‘holies of holies upon the very rock where the Jewish forefather, Abraham, offered up his son, Isaac, to be sacrificed. This offering was directed by God. However, God stopped the sacrifice just before Abraham could follow through on it and provided a substitute…a ram allowing his son to live. This substitute served as a precursor of the “Lamb of God,” Yeshua (the Lord Jesus Christ), who became our substitute so that we could live forever. Since the significance of this place cannot be overstated, it is beyond belief to suggest the third temple would be rebuilt on another spot. Understanding this… is a ‘key’ to understanding if the US peace plan will be realized. Since the Temple Mount is located in East Jerusalem… and since the Jews will be granted permission (as part of the end-times treaty) to rebuild the temple there, we can see from the Bible that East Jerusalem will never belong to the Palestinians. Thus, Israel will not relinquish that part of the city (nor any other) prior to the end-times treaty. The Bible teaches that the Jewish people are witnesses to the existence of God and that the Jewish people will continue to exist, irrespective of attempts to remove them from the face of the earth. 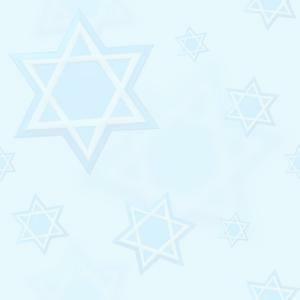 Is it not a miracle that the Jews have returned to the land promised to them from the time of Abraham? Other Old Testament nations have disappeared from human memory… where are the Hittites, the Moabites, the Philistines or the Perizzites? They have all vanished away but the Jews are still with us and the Old Testament prophecies are still to be fulfilled. God will send His two witnesses to proclaim the Gospel of the Kingdom, and He will finish the wrath of God with His Son’s Coming. The war has always been over the souls of humankind, and one could see the analogy of East Jerusalem as the soul of the world. One day, the Holy City will be shown the sins it has always delivered in the name of man… and the New Jerusalem will come from the sky in all of its Glory made by the Hand of God. Friends, we are approaching that day, and the world cannot keep God from proclaiming what is rightfully His, including us as we are engraved upon His Hands. Keep looking up!